From the original Cars, here we have the brand new (re)-release of My Name is Not Chuck (with cart)! 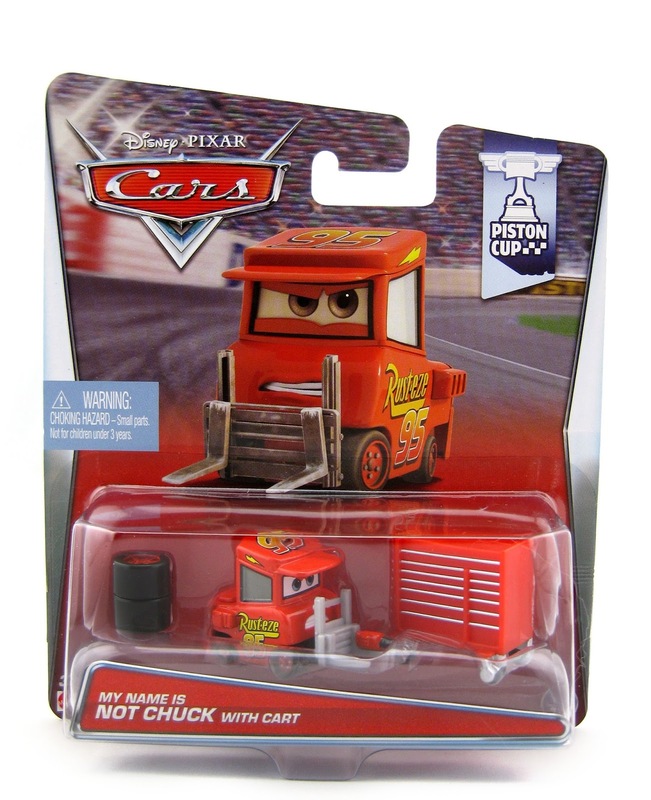 This release is part of the 2015 "Piston Cup" sub-series (#17/18), but he was originally available way back in 2007 as part of the "World of Cars" collection. I'm so glad that he has finally made his way back to store shelves again after all these years! As usual, this character is a 1:55 scale diecast with plastic parts and accessories. As shown in the screenshot above, "My Name is Not Chuck" is one of Lightning's team pitties seen several times during and after the film's opening race. During a TV interview after the three way tie, Mcqueen states that he's a "one man show" and tells this pitty to move out of the way (calling him Chuck). This leads to one of the most subtly hilarious moments of the film when this angry pitty quits and storms off yelling "...And my name is not Chuck!!" Gets me every time. 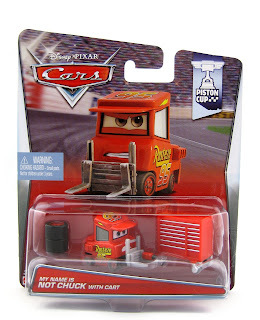 I don't typically collect the Piston Cup race team crew chiefs or pitties (since there are just way too many of them), but this one was a must have since his small role and few lines were so memorable. Plus I love how the name here on the package is simply "My Name is Not Chuck." Hilarious! I wonder what his real name is? ;) All the Wiki pages just call him "Not Chuck." I was able to find this one just this past week at Walmart; so if you're looking to add this one to your collection, be sure to head to your local store to check for availability! If you'd rather just pick it up online, you can visit this direct link to current eBay listings or check out Amazon using the link below. Have fun on the hunt!